Sky Blanket took a break last month, what with it being the summer holidays and all. 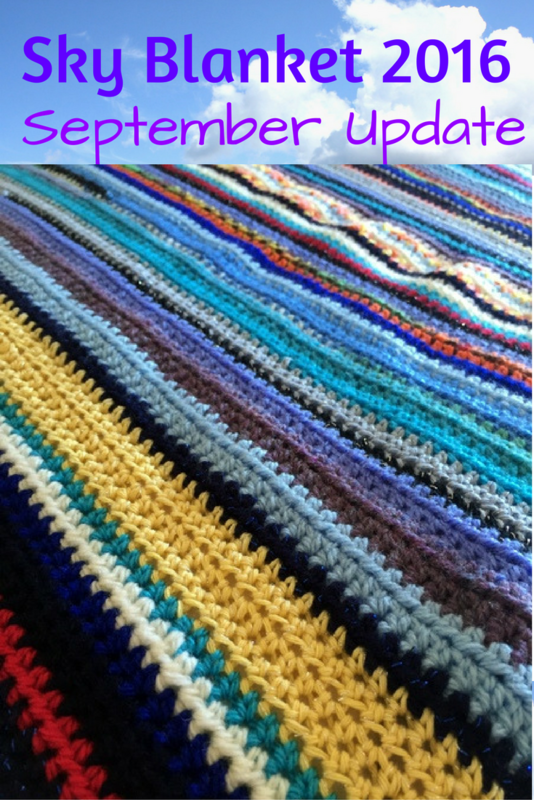 But I am back with the crochet this month, so here's the September update in this mammoth year-long project. I wish I had, but I haven't taken any sky photos this month. So although we've had some truly spectacular colours adorning the heavens this month, I hate to say I do not have any photographic evidence to prove it. So you just have to take my word from it. Or check the colours I got inspired to use in my crochet as a reflection of the sky for the day. All crochet for this month will be rows of half trebles with a hook size 5. Here are the details of this month's pattern, from top to bottom, in case you fancy crocheting along. 1 - cloud blue. Last of the summer sunshine? I hope not. 3 - aster / sparkly black. That's the last of the aster in this crochet project, for I have run out. Half and half, now that's a first with this Sky Blanket. Bet it won't be the last as I start running out of more colours. Enforced patterns is a good thing, don't you think? 30 - rainbow colours for a fab double rainbow that my little boy spotted in the sky. Here is how my Sky Blanket looks now, at the end of my eighth month of crocheting. What do you make of it?